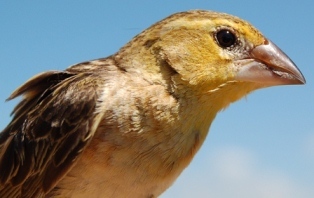 The Red-headed Quelea has increased in numbers along the eastern coast of South Africa over the last few decades. Males in full breeding plumage are relatively easy to identify. Males in non-breeding, or even moulting, plumage and females and young birds are more difficult to recognise if one is not familiar with the species. Look out for yellow edges to the primaries to distinguish queleas from widows and bishops which have buff edges. Stan Culley recorded a fantastic series of photos of birds in different plumages on the south coast of KwaZulu-Natal - see here. Photo: adult female Red-headed Quelea. Sightings of Red-headed Quelea anywhere in southern Africa should be submitted here (and for Red-billed Quelea in the Western Cape only here).